My come back race after a disastrous year of not finishing or starting races sadly including an attempt at 100k in Winshouten. I thought the best way after a 6-week race break was to do a team event with less pressure. 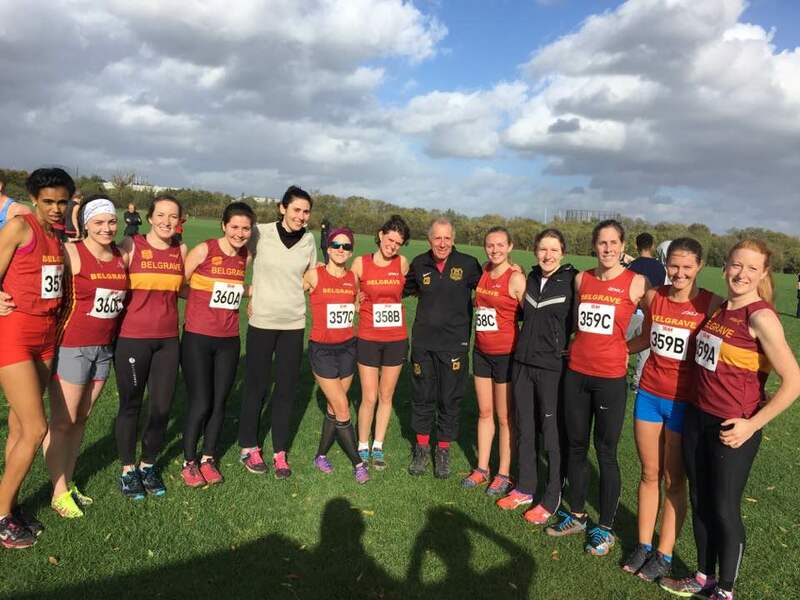 40 mile hr winds greeted no less than twelve Belgrave women starting the 3-Stage cross-country relay at Wormwood Scrubs. 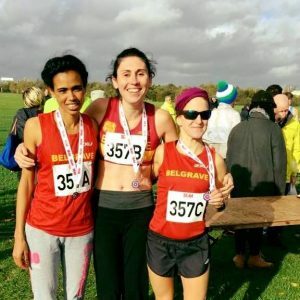 The largely flat circuit of just over 3km on grassland appeals to track, road and cross country runners alike so it was four teams that completed the race. With Belles out in force ( and the wind) the hard work paid off for the A team winning a well-deserved silver medal which I was part of. On our first leg for the A team, Saron Haileselase sensibly held back over the first kilometer or so, happy to sit in the pack in about sixth place being protected from the wind. She made her move on the far side of the course easily moving up to the far away leader passing all the other runners on the way. Saron hates the wind but battled her way against it up the final straight to finish a close second in a terrific time, the third fastest of the day, and a very long way ahead of the third place athlete. Her run certainly set the team up with a chance of a medal. Katie took over from Saron and although she had not felt 100% during the week, ran a very strong leg to maintain second place handing over to me as our anchor leg. Although there was a large gap to the likes of Chloe Tighe of Herne Hill and Stefanie Davies of Clapham Chasers chasing hard for the medals, there is no one more reliable than Sammi in this situation, and the Belle’s second-fastest leg of the day easily brought the team home safely to secure well-deserved silver medals. Boys n Belles out in Force! Chelmsford 36.37, 2, Belgrave A 36.59, (S. Haileselase 11.43, K-E. French 12.50, S. Amend 12.26) 3. London Heathside 37.10, …… 13. Belgarve B 40.24, (J. Rhodes 14.00, I. Cousland 13.18, L. Goldie-Scot 13.06), 16. Belgrave C 40.35 (F. Maddocks 13.28, K. MacKenzie 13.31, R. O’Brien 13.26) , 20. Belgrave D 41.10 (M.Hall 13.44, M. James 14.08, J. Levertaviciute 13.18).